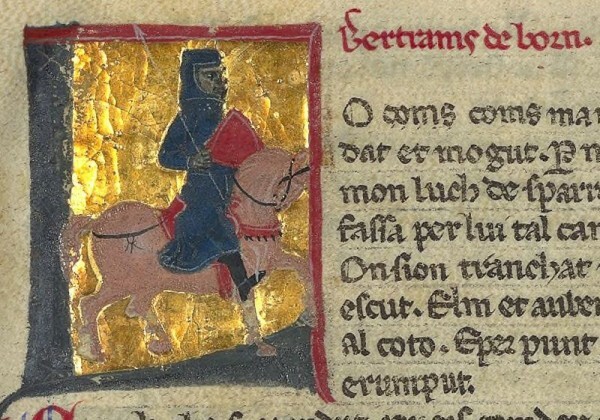 Bertran de Born (c.1140-1202), lord of Autofort, was one of the most famous French troubadours of the Twelfth century. His poetry covers a wide variety of topics, including warfare. and I enjoy everything the most. to the man who now counsels [King Philip of France]. as good as war, trouble and action. Let [King Philip] know that! nor inflict a severe wound on a leg or head! at the head of his men, or a great army. that he has never broken a lance on a shield. yet he can just lie around and grow fat! soon becomes fat and detestable. Occitan text from The Poems of the Troubadour Bertran de Born, ed. W.D. Paden et al. (Berkeley: University of California Press, 1986), 339-343, 357-359. Translation by Clifford J. Rogers. This entry was posted in Primary Sources and tagged 12C, France, literature, Poetry. Bookmark the permalink.